We offer exterior louvered shutters constructed from three different materials. High quality natural wood exterior louvered shutters have been used for centuries to make American homes more comfortable, safe, and attractive. We use three kiln-dried lumbers to forge stiles, rails, and louvers that compose our line of premium wood shutters. Each panel is assembled with time-tested techniques for maximum strength and longevity. California Redwood is a distinct species that is popular for construction of many outdoor structures, including decks and fences. It is lightweight, strong, and naturally resists insects and decay. We use Select Grade B (97% clear) Redwood, which may contain minor blemishes. It is a step down from top grade lumber, yet perfectly acceptable for construction of exterior louvered shutters. The price of Redwood shutters is at the most affordable level and the best overall value. 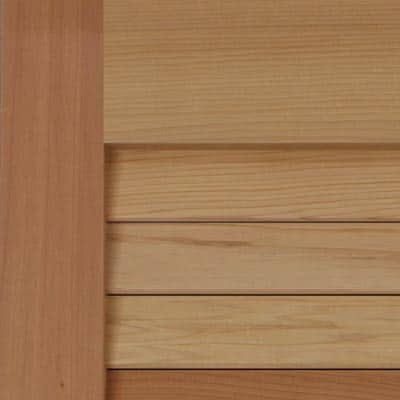 Western Red Cedar is the most common material for building exterior shutters in the industry. Cedar has many of the same qualities as Redwood, yet is less dense making it easier to sand and finish. We use Select Grade B (99.5% clear) and better Cedar to begin the manufacturing process. Cedar shutters sell at a slightly higher price point than Redwood. African Mahogany is revered for its beautiful reddish-brown color and straight, even grain. This hardwood possesses superior rot resistance and is frequently used in boat building. Mahogany is often selected for the brilliant tones and patterns preserved by staining. 99.9% Select and Better grades are used in construction of our Mahogany shutters. The panels are heavier than those made from other woods. 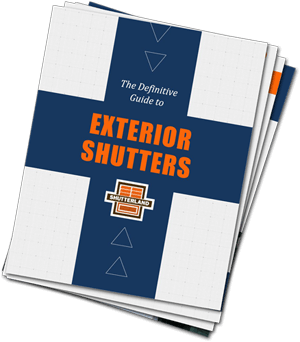 ShutterLand also offers an introductory grade louvered wood shutter. 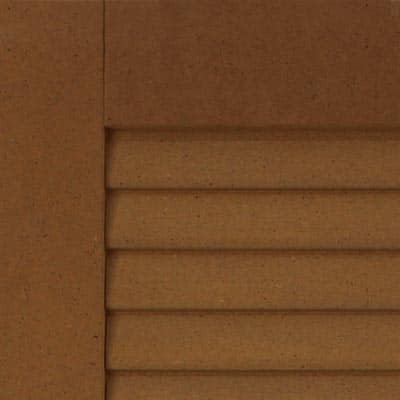 These exterior panels are intended for use on buildings and homes that need a quick, inexpensive external restoration. Economy wood exterior shutters generally have a shortened life because of the species and grade of wood. 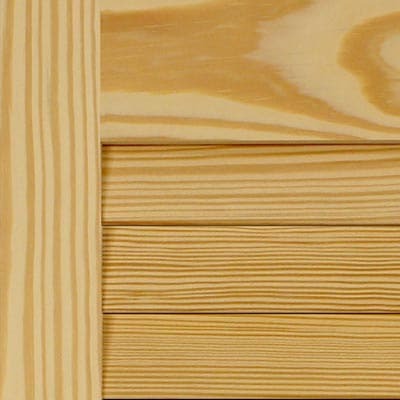 Southern Yellow Pine is a versatile, dense species that is used in construction of many aspects of the home. We use 99.9% knot free Grade C or Better. We use the same construction techniques applied to our premium wood shutters. Synthetic materials have only recently become an acceptable substitute for natural wood. Our composite exterior shutters are constructed from a high quality durable material that is impervious to moisture, rot, and termites. Composite louvered shutters outperform wood in many categories. Extira is an engineered product formed with sustainable wood fiber (sawdust) and marine grade resins. The raw materials are pressed into dense rigid panels. Shutter components are cut from larger sheets and shaped to specification. Composite shutters can be hinged but have only one presentable side. Banks of louvers are cut from a single piece with no space between slats. Composite panels are priced lower than premium wood shutters. Louvered shutters should always be installed with the louvers angled up when in the open position and away from the window when closed. And all shutters should be mounted to give an illusion that they could be functional and close over the window.